So I understand the distance math behind achieving hard and soft shadows. What I'm not as well versed in is methods for HARD HARD line shadows when not shooting in the biggest of spaces (only 10ftx15ft). Any quick tips or pieces of gear I'm over-looking to achieve hard shadow casting? You can use Leko style lights that have lenses on the front, although you still may not have enough distance. This can be overcome with bouncing it into a mirror. Dedo lights are also very very helpful. Leko and Fresnel tungsten lighting is what MOST people use for this. You can also use an open face with some black foil to control the light a bit. Dedolights and mirrors are your friend. Open face lights with reflector removed. Point source will give you hard shadows. Forgot to ask, how do the mirrors come into play? They can increase the distance from the source to your subject. Through putting the mirror at a farther away distance and pointing the light back to the mirror, therefor the mirror's reflection illuminates for shadows? How much of a difference does that make as opposed to just putting the light as far back where the mirror would be? I'm not sure I understand that question. The important distance is the distance that the light travels. So, keeping the ideas really simple, one could double the distance with a mirror. Or do even better by using the 15' and 10' available with the mirror at 45 degrees. Let's say the full distances of both of those diagrams is 10 feet. Does shining the light back into the mirror and adding an extra 5 feet of distance traveled really do that much to the shadows? As opposed to just moving the light back to where the mirror was? If so, I'm trying to wrap my brain around how the physics of that works. And also how many stops would get lost. I rarely see mirrors as it is don't ask me why. If the distance from light to mirror plus the distance from mirror to subject in setup A equals the distance from the light source to subject in setup B, than they should be equally hard. This is the case because the light source would be the same size from the perspective of the subject. The mirror just allows you to back your light further up from your subject than a small room with limited space would do. To increase the sharpness or hardness of a light, generally you will want to decrease its size and use a light with great throw. Usually optically more sophisticated designs work better for this, such as the aforementioned dedos (I also love their 650W version, such a pleasure to use and would also be great for this), lekos (you might want to use their EDLT lenses for this, as they are optically superior to the standard ones) or fresnels. Open face lights dont cut as nicely, because the source is not as clean, as you have both the reflector and the lamp itself which emit light. If someone's selling a Dedo kit then let me know. Probably need this in my arsenal. So often I'm like "I want an awesome hard shadow cast"
If you make a drawing of the 10x15' space, with the subject placed, you will see the possibilities. The smaller the source of the light the harder the shadow. 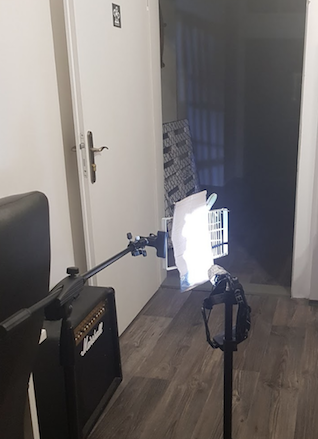 I found out that those chinese LED flashlights work wonders for casting really hard edge shadows. They are also really powerfull and as used for the background you dont have to care about CRI. Yeah now that you mention flashlights those create the hardest shadows I know of by memory. Investing in a super bright one wouldn't be too bad budget-wise.